Sulfuric acid is one of the world's most widely used chemicals. It finds numerous applications as in the production of fertilizers, explosives, plastic (polyurethanes), esterification of intermediates, dyes and also within the iron and steel industries. 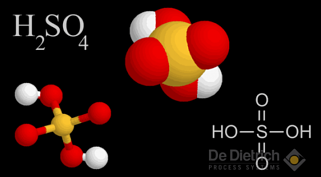 The method used today for its production from sulfur, respectively SO2, is the so called "Contact Process". SO2 is oxidized with oxygen on a heterogeneous catalyst - vanadium pentoxide contact - to SO3 and subsequent absorbed in ~98.5%wt sulfuric acid giving oleum which is rediluted with water down to 98.5%wt. Therefore, this process typically produces sulfuric acid of 98.5%w/w concentration or stronger in the form of oleums. Some of the processes and applications using sulfuric acid require weaker acid than this. As a result, dilution equipment is often necessary in order to meet the requirement for this weaker acid. On the other hand, in most chemical processes, contamination and dilution of concentrated sulfuric acid occurs producing huge waste streams of contaminated spent sulfuric acid. An example is the production of Dinitrotoluene (DNT) where the waste acid of sulfuric acid is contaminated with nitric acid and partially nitrated toluene. Another example is the use of concentrated sulfuric acid for drying of gases like chlorine, bromine, hydrogen chloride or methyl chloride providing sulfuric acid with less than 80%w/w. Recycling this spent sulfuric acid is either a precondition to run such processes profitably or generates considerable cost savings for raw material and effluent disposal. De Dietrich Process Systems builds clean, modern plants around the world to produce acid for re-use without contaminating the environment. It is important to know the behavior of the binary mixture sulfuric acid/water for all the processes mentioned above. The sulfuric acid / water system displays a maximum azeotrope at 98.3 wt% sulfuric acid concentration and a temperature of 338°C at ambient pressure conditions. A large separation factor exists (see illustration 1); furthermore, almost no sulfuric acid is contained in the vapor up to a concentration of about 70 wt%. The vapor concentration of the sulfuric acid increases very strongly only from a fluid phase concentration of about 85 wt%. 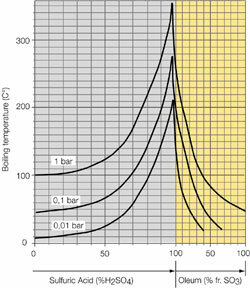 The following diagram shows that the boiling temperature at ambient pressure is quite high e.g. 338°C at the azeotropic point. Sulfuric acid at this high boiling temperature is very corrosive to almost any material of construction. Steam or oil at these temperatures are economically no more reasonable as heating media. The old fashioned route for re-concentrating sulfuric acid is therefore the so called pot or drum concentrator where the acid is either boiled with a burner in a silicon iron pot or injected with combustion gases into brick lined drums. The environmental consequence of these high temperature operations is the generation of exhaust fumes consisting of combustion products and often significant amounts of sulfuric acid mist. In order to overcome the environmental and corrosion problems we have developed a process to concentrate sulfuric acid under vacuum. This enables to concentrate sulfuric acid up to 98wt% at less than 210°C which permits the use of steam as heating media and the use of glass-lined steel, borosilicate glass 3.3, Tantalum and PTFE as material of construction. The lower limit of the operating pressure (vacuum) in the boiler is limited by the temperature of the cooling media which has to condense the evaporated water at this low pressure. We provide highly efficient and environmental friendly process plants to recover, purify, concentrate or dilute sulfuric acid in a safe and reliable manner over a wide concentration range even up to 98wt%. The concentration of sulfuric acid is essentially the evaporation of water. Any nonvolatile impurities as salts will remain in the acid and may potentially precipitate. Nonvolatile organic impurities either decompose during the concentration process or will have to be decomposed before entering the QVF horizontal boiler. A common diluted feed stream for the recovery of high concentrated sulfuric acid is a sulfuric acid coming from a chlorine drying process with a concentration of 74-78%wt. The concentration process is carried out under vacuum in order to decrease the boiling temperature. This is necessary to avoid any corrosion and to enable the use of steam (typically at 13-17barg) as heating media for the tantalum tubed heat exchangers. 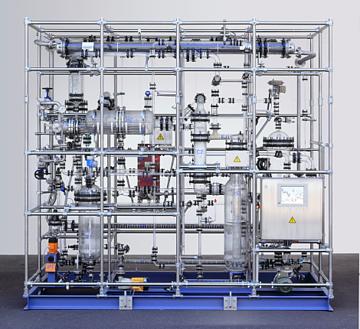 The optimum process vacuum is chosen with respect to the temperature difference between the heating steam and the boiling acid as well as the temperature of the cooling agent. As an alternative to heating steam, electrical quartz heating sticks can be used. 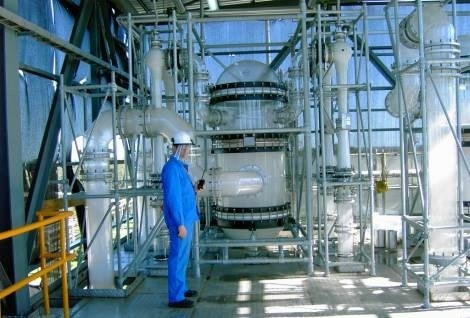 To concentrate from 66%, the process would be carried out in two stages: the first vacuum evaporation stage up would provide up to 88-90%wt and a second stage at an even lower vacuum giving the final concentration of high concentrated sulfuric acid. Because of the acidity of the vapors from the high concentrated boiling sulphuric acid, it is necessary to scrub the vapors. This is done in a column above the evaporator with the fed diluted sulfuric acid. The concentration of sulfuric acid in the condensate is mainly determined by entrained aicd droplets and is less than 1%wt. As an example of good engineering practice, and to minimize operating costs, energy recovery is realized by preheating the cold feed with the concentrated liquid hot sulfuric acid leaving the evaporator. The vapors are condensed in corrosion resistant condensers. 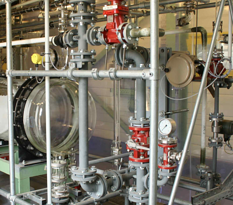 In addition, DDPS can carry out test runs with your acid waste stream in our test facility to insure reliable operation and provide a process guarantee. 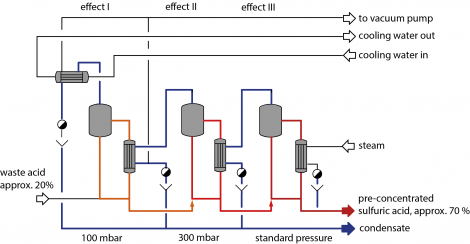 Reduction of operating pressure to decrease the evaporation temperature far enough to permit the use of steam as heating media. The selection of the suitable material combination is crucial for this process. Only few materials are resistant against concentrated sulfuric at temperatures above 200°C. Therefore, all equipment in contact with the acid is manufactured from borosilicate glass 3.3, glass-lined steel, PTFE, tantalum or quartz for a long life time. The vacuum of the first stage is generated by using the condensate as liquid either with a liquid ring pump or more corrosion resistant setup. For a lower vacuum required at the second evaporation stage a jet pump is employed using steam. 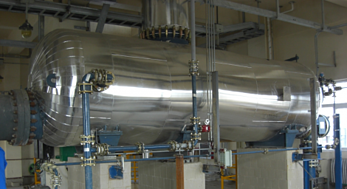 For further cooling of the concentrated sulfuric acid and condensation of the acidic water, the shell and tube heat exchangers must be corrosion resistant only on the shell side so that stainless steel covers and support plates can be used on the cooling water side permitting a cooling water pressure of up to 6bar. This design consists of a bundle of bayonette type Tantatum heating sticks in the lower part of a laying horizontal evaporator shell made, depending on size, either of borosilicate glass 3.3 or glass-lined steel. The diluted sulfuric acid enters the shell near the header of the bayonette type heating stick bundle. The diluted acid flows then while being concentrated towards the outlet of the evaporator shell where the heating sticks end. On their way out through the horizontal boiler the acid flows through baffles that separate the horizontal boiler body into differnent stages. As the baffles avoid back mixing a temperature profile due to the concentration profile in the evaporator unfolds. This increases the average temperature difference between steam and acid and hence minimizes the required heat transfer area. This lowers the costs of the Tanatalum heating sticks. The acidity of the vapor rises virtually exponentially with the acid concentration, the vapors generated at the front end of the QVF Horizontal Boiler have an acidity in the region of 1 ppm, compared to almost 3% at the end and discharge of the QVF Horizontal Boiler for the above concentrations. The QVF Horizontal Boiler therefore reduces the acidity in the leaving vapors, which gives lower acid losses and reduced effluent treatment cost. In addition since everything is internal, there are no circulation lines or circulation pumps handling hot concentrated sulfuric acid, reducing maintenance costs and risk of failure. Depending on the difference between the concentration in the feed and in the product one, two or three evaporator stages operating at different vacuum levels offer the optimum solution. Under ideal conditions the QVF Horizontal Boiler can be employed for concentrations up to 98% sulfuric acid otherwise quartz heating sticks will be foreseen. QVF Horizontal boiler with glass shell and a Tantalum heater bundle. QVF Horizontal boiler with a glass-lined shell and a Tantalum heater bundle. The column consists of components as column sections, distributors, column packing, support trays being developed by De Dietrich Process Systems over decades. In order to minimize the concentration of sulfuric acid in the condensate, the up-rising vapors from the evaporator are scrubbed with the feed acid entering at the top of a scrubbing column. The feed acid is equally distributed over the full cross area of the column packing by means of distributors of different QVF types depending on the column size and throughput. The column packing has to combine a high corrosion resistance, a high separation efficiency with a low permissible pressure drop. In most cases the QVF DURAPACK is therefore the ideal choice. 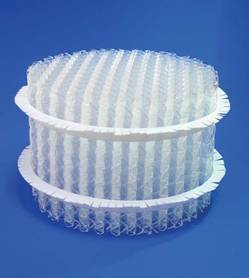 This inhouse column packing is a patented structured packing made of borosilicate glass 3.3. 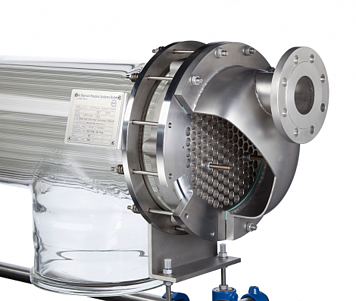 Multi-stage evaporators save energy when concentrating sulfuric acid from 20 wt% up to e.g. 70 wt%. Concentrating sulfuric acid from 20 to 70wt% means to evaporate an enormous amount of water out of the sulfuric acid. Single or multi stage natural circulation evaporators are used to minimize the required amount of heating steam. The below diagram shows a 3-stage plant where the 1st stage is heated by the vapor from the 2nd stage, the second stage is heated by the vapor from the 3rd stage and only the 3rd stage is heated with fresh steam. 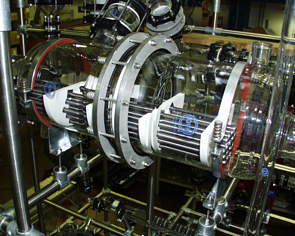 The 1st and 2nd stage are operated under vacuum in this example. The number of stages and the type of heating system for each stage are governed by the concentration of the waste acid and the available heating media. Account must also be taken to the behavior of the acid during the concentration process such as the generation of gases possibly leading to foams and the precipitation or evaporation of products present in the waste sulfuric acid. Under certain conditions it can also be technically or economically advantageous to use forced-circulation evaporators or single-pass horizontal evaporators. Electrically heated quartz immersion heating sticks can also be an option for small evaporators. 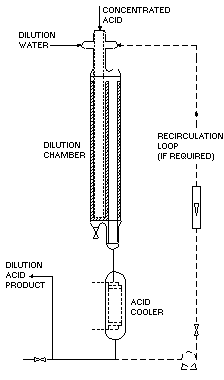 The dilution chamber illustrated in figure 1 has the capability of diluting acid of any concentration to produce sulfuric acid of any desired concentration. Typically, the concentrated acid is fed down the inner of two concentric pipes while the dilution water is passed down the outer one. The acid and water mix at the outlet of these pipes and then slowly flow up through a packed bed - in order to ensure good mixing and the avoidance of local hot spots - and exit from the chamber via an overflow pipe. Typically, the concentrated acid is fed down the inner of two concentric pipes while the dilution water is passed down the outer one. The acid and water mix at the outlet of these pipes and then slowly flow up through a packed bed -in order to ensure good mixing and the avoidance of local hot spots - and exit from the chamber via an overflow pipe. 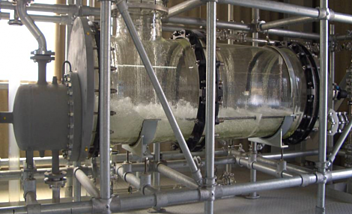 During the mixing/dilution process,considerable heat can be liberated and it is normal practice for the hot dilute acid leaving the dilution chamber to be cooled. In some circumstances, the amount of heat liberated within the dilution chamber is sufficient to produce boiling of the acid and so, in order to avoid this, provision is made to recirculate a portion of the cooled dilute acid, thus ensuring the temperature of the acid leaving the chamber is below its boiling point. Throughputs and sizes of the standard range of dilution chambers are shown in the table below. Product purity is guaranteed. The glass dilution equipment can be used in the production of high purity grades of sulfuric acid. For example, battery, reagent and electrolytic, product purity being dependent only on the purity of the acid and dilution water. For these grades, glass dilution equipment is often used in conjunction with a glass S03 absorber. The equipment is simple and easy to operate. The equipment is extremely versatile. Borosilicate glass is completely inert to all sulfuric acid concentrations and so can be used over wide concentration ranges. Concentrated sulfuric acid is used within many chemical processes where the consequent dilution of acid occurs. For example concentrated sulfuric acid is used for drying of gases like chlorine, bromine, hydrogen chloride or methyl chloride. If the dilute sulfuric acid is concentrated back to its initial composition, it will be possible to recycle the sulfuric acid to the process and to generate savings in raw material costs and in effluent disposal costs. 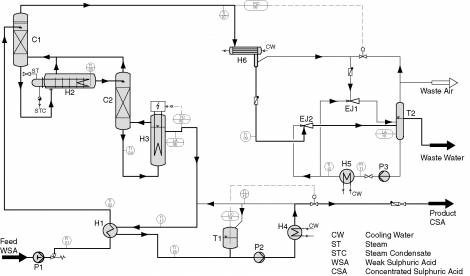 In the following, standard process plants developed by De Dietrich Process Systems for concentration of low and medium loads of sulfuric acid are described. Materials of construction for parts wetted with acid are exclusively borosilicate glass, quartz, tantalum, silicon carbide, PVDF and PTFE. Therefore the excellent corrosion resistance across the complete range of concentration ensures reliable operation. The concentration of sulfuric acid is essentially the evaporation of water. This concentration process is carried out under vacuum in order to decrease the boiling temperature, which is particularly necessary for higher sulfuric acid concentrations. The working pressure is chosen carefully with reference to the temperature difference between the heating agent and the process as well as the temperature of the cooling agent. In addition to heating by means of saturated steam, electrically heating by immersion heating units made of quartz can be useful. Thus the energy for vacuum generation is reduced considerably and it is still possible to condense the vapor by means of ordinary cooling water even for a final sulfuric acid concentration of 96 wt.-% H2SO4. In case of a liquid concentration above 75wt.-% H2SO4 it has to be taken into account that the H2SO4 content of the vapor increases very steeply. For this reason vapor scrubbing columns are placed upstream to the evaporators in order to minimize the sulfuric acid content of the condensed waste water. The scrubbing columns are equipped with the structured packing DURAPACK made of borosilicate glass, which enables high capacity, low pressure drop and simultaneously high efficiency mass transfer even for treatment of boiling concentrated sulfuric acid. The DDPS standard plant for concentration of sulfuric acid is depicted in the flow sheet shown above. Weak sulfuric acid, e.g. sulfuric acid of 80 wt.-% H2SO4, is fed by dosing pump P1 via recuperator H1, into scrubbing column C1. In H1 the acid is preheated by means of the of concentrated product acid, e.g. sulfuric acid of 96 wt.-% H2SO4. In scrubbing column C1 the acidic content of the vapor, produced in evaporator H2 and scrubbing column C2, is washed out. Next the acid enters the horizontal evaporator H2 at one end and leaves it with higher concentration at the other. 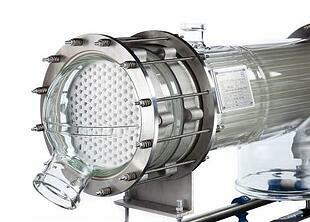 Evaporator H2 is designed as a horizontal vessel made of borosilicate glass. The lower part of the evaporator is equipped with baffles in transverse direction. In flow direction the baffles approximate to a chamber cascade, and the acid is concentrated step by step within the chambers. Discharge of higher concentrated acid out of horizontal evaporator H2 is done via free overflow and the acid is fed to the top of scrubbing column C2. 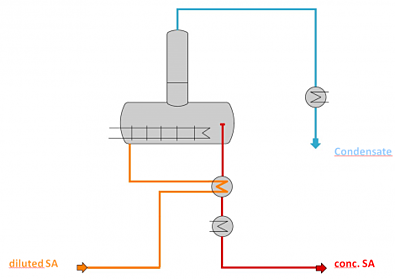 The aim of column C2 is the first step purification of the vapor rising from evaporator H3. The further scrubbing of acidic content from the vapor out of evaporator H3 is carried out together with the vapor out of evaporator H2 in scrubbing column C1. Intermediate strength acid from column C2 enters evaporator H3 and leaves this vessel with the desired concentration. The heating of evaporator H3 is maintained electrically by immersion heating units made of quartz, enabling operation at temperatures of 180-220°C. Discharge of high concentrated product acid from evaporator H3 to recuperator H1 is done via free overflow. The horizontal concept of both evaporators and of the free flow acid discharge eliminates the need for any pump in the hot process section. Vapor from scrubbing column C1 is condensed in condenser H6. Arising condensate leaves the plant via free overflow out of separator T2. Vacuum generation is achieved by liquid jet pump where the arising condensate is used as working fluid. Due to the use of condensate as working fluid, additional waste streams are avoided. QVF standard plants for sulfuric acid concentration are equipped with automated process control systems, the operation is through "on screen" control. A plant which is, insulated, pre-assembled to a great extent and requiring only short time for erection on site. A low overall height due to the use of the horizontal evaporator. No additional waste water streams besides vapor condensate. Exclusive application of reliable materials of construction with excellent corrosion resistance. No pumps in the "hot" acid section. Plants of further sizes are available as standard. On request it is possible to provide all standard plants with modifications, e.g. application of glass lined steel instead of glass in the hot acid section. The following table gives performance figures for standard plants of size 2. Our complete service capability for sulfuric acid concentration is of course far wider than the standard plants presented above. Thus we can offer many different solutions for concentration and purification. Our highly experienced engineers will be pleased to offer an individual proposal tailored to your needs.